In 2011 Meulensteen presented Flat Screens, an exhibition of new work by Siebren Versteeg; this is the artist�s third show with the gallery. At the core of the exhibition is a series of unique, backlit digital prints on DuraClear. These images, reminiscent of gestural abstract painting, are captured from mutating compositions generated by computer programs that the artist has written. The images are developed in digital space, without the use of physical paint. Through this work, Versteeg continues to develop his interest in the circulation of information in the digital realm and the algorithms that guide their flow. He manipulates this language to create artworks that balance choice and chance. They engage critically with the systems used for the dissemination of images within our culture, as well as with the technology used to create them. Philosopher Vil�m Flusser�s Into the Universe of Technical Images informs this most recent body of work, furthering the artist�s ongoing exploration of the intersection between algorithmic programming and artistic mark making. Versteeg�s work taps into an interesting parallel: Flusser describes the history of communications in a similar manner to the way Clement Greenberg summarized the history of painting: as a progression towards abstraction. In his seminal text, Flusser meditates on what he saw as the two possible divergent outcomes for humanity�s future: overwhelmed by images, we might witness the birth of the first infinitely creative society, or be trapped by an inescapable and oppressive pattern of sameness. The work in Flat Screens operates on the razor�s edge between these possibilities. Flusser also notes that text has been eclipsed by the image as the prominent form of communication. Versteeg interjects in this discourse by using text, in the form of computer programming code, to create images. 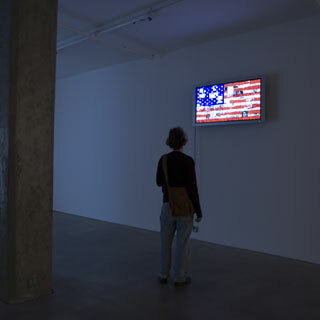 As the exhibition�s title suggests, Versteeg plays with the notion of the flat screen. It appears as an illuminated still image (as in the work previously described), and in The Three Lights. 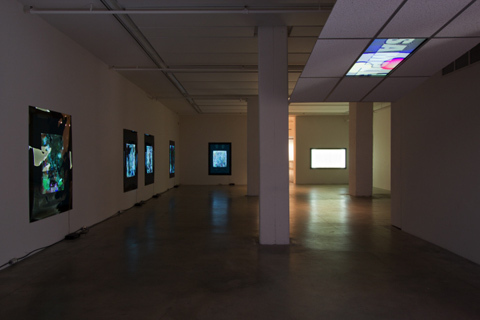 In this work a flat screen monitor, hung from the gallery�s ceiling and surrounded by a grid of similarly proportioned ceiling tiles, displays an evolving collage of internet images from real-time searches for the terms �red light,� �green light,� and �blue light.� Two editions of the work will run simultaneously in the exhibition, generating two unique outcomes. In another work, which bridges the language of painting and the technological image, a piece of raw canvas, cut to the 4:3 aspect ratio of a standard definition television monitor, hangs inside a light box constructed to the 16:9 aspect ratio of a flat screen television. The lateral bars (pillarboxing) that appear when an image is displayed within a wider image frame appear in this work as bright bands of light. Here, as he does throughout the exhibition, Versteeg points out the oddity of imposing conventions from one medium onto another.